In case you didn’t know yet, we have a Facebook Page ! 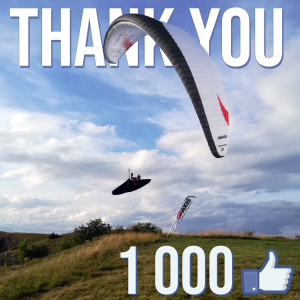 And we have just reached the symbolic number of 1 000 likes ! If you are not one of the 1 000 yet it’s never too late, you just have to click on the link above ! It’s actually one of the best way to get the news about the company, to see photos and videos of the gliders, and to communicate with us. Copyright © 2019 AXIS PARAGLIDING | Be different, Be Axis, Be yourself! All Rights Reserved.